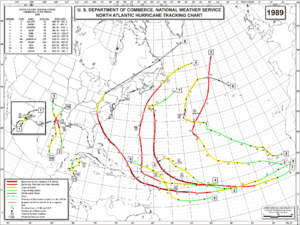 The 1989 Atlantic hurricane season officially began on June 1, 1989, and lasted until November 30, 1989. However storms can form outside these dates for example, Tropical Storm Karen lasted until December 4. This season had average activity with 15 depressions, 3 became a tropical storm, 5 became a hurricane, and 2 became a major hurricane. This was a damaging season because this season featured the powerful Hurricane Hugo. In the spring of 1990 Hugo had its name replaced by Humberto in 1995. 1989 Atlantic hurricane season Facts for Kids. Kiddle Encyclopedia.